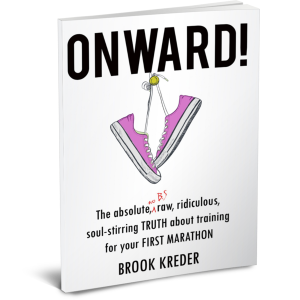 If you're a female runner and haven't heard of Brook Kreder or read her book ONWARD! The Sole Revolution, then you definitely need to check it out as well as her website. Even if you're a guy, check out her book. It's hilarious and cuts to the core of what it means to be a marathon runner. "Sitting in a dingy hotel room, with a bag of Cheetos in one hand and a vodka tonic in the other, Brook decided it was time to rethink her life. Her business was on the skids, her marriage was stalling out, and her future looked anything but bright. In a flash of insight, she made a spontaneous decision that ultimately changed everything. 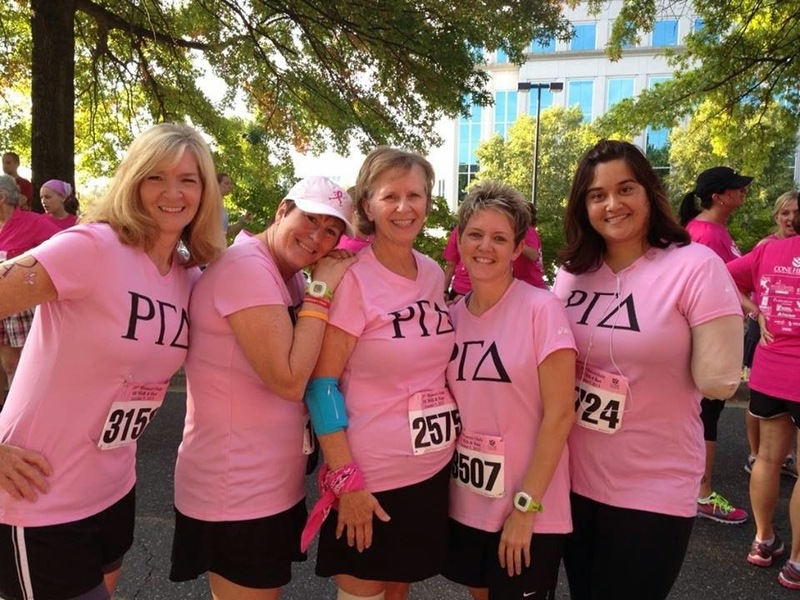 Armed with little more than a iron-willed determination, a pair of old running shoes, and a blog, she began training for her first marathon." I've interviewed dozens of runners with amazing stories of how running has changed their lives or how running their first marathon changed their lives. Brook encapsulates the struggles and celebrations that come with setting off on a journey in to the world of running like none other. Another "Rock Star" of running happens to be one of my very own runners, Melani. I first met Melani about 2 years ago when she joined one of my beginning running groups. Just recently she completed her first marathon, the Raleigh Rock-n-Roll. I'm so proud of her accomplishments as I am of all my runners tackling the daunting and scary task of running a first marathon. The running powers that be saw fit to bring these two awesome ladies together. Brook has featured, Melani on her blog. Check out her story and Brook's interview of Melani below. Some people are born with athletic prowess. You know what I’m talking about. Runners who run with such ease you suspect they may have popped out of the womb with running shoes strapped to their feet. Let me be clear about something: Genetics did NOT deal me that hand. I am not that person. In fact, I didn’t even START running until I was almost 39 years old. It’s ironic. More times than not, we want what we don’t have… those without wish they could have… while those who have wish they did not. I clearly fell in the “wish-they-did-not” camp. And at 38, I finally made the decision to “down-size”; simply aiming to bring some much needed proportion to my 5 foot 2 inch frame. After some healing and much soul searching, I decided to do something I’d always secretly wanted to do but was too self-conscious to try. At almost 39 years old, I joined a Beginner’s Running Group led by a local runner known to most simply as “RunnerDude.” At that point, I couldn’t run two consecutive minutes. No lie! The group met twice a week and followed a run/walk format that had us running 30 minutes, (about the distance of a 5k), by the end of the 12-week program. At that point, I signed up for my first 5k. [Full disclosure: I was so scared the morning of race day that I likely would have bagged it had I not had someone driving me to the start line. And even then, I gave serious thought to bolting in the opposite direction when the gun sounded.] Even so, I finished my first 5k in 29:50. In hindsight, this was a turning point for me. While I was certainly getting healthier… I was also gaining confidence. At the end of the Beginner’s program, I continued to run. I joined an intermediate group of runners, (coached by the guy who led my Beginner’s group), and eventually gained the ability to extend the length of my runs and quicken my pace. Over the course of about a year, I participated in a handful of 5k’s and knocked down my first half-marathon with a time of 2:03:42. But it was only18 weeks ago, (at the age of 40! ), that I committed to running a marathon. And last week I did something I could never have imagined just two short years ago. I crossed the finish line after 26.2 miles. Right there on the corner of exhausted and oh-hell-yea-I-just-did-that! Was I blazing fast? Hell NO. Am I okay with that? Hell YES! Because as runners, we know it’s about more than measuring miles. It’s about ordinary people with extraordinary passion. It’s about freedom, friendship and finding inner strength. Together, we are getting healthier, gaining confidence and accomplishing goals that once seemed impossible. It’s about getting stronger each and every day. It’s about showing up in life and making a difference. To continue Melani's story and Brook's interveiw of Melani, click here.